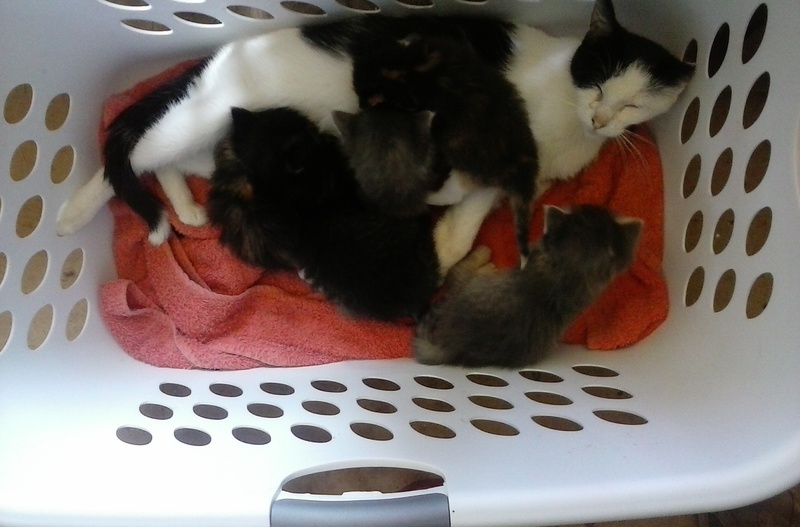 The picture above is what happens when a barncat mother of 6 wakes up to find 5 extra kittens in the kitten bed. And it looks like she’s going to have to keep them. Charybdis, first time mama of 6, has to take care of the kittens of Consubstatial 1, who ran out the door and hasn’t come back. Escaping mama cats is a chronic problem around here. Most of my cats are barn cats, but I bring the pregnant ones in the house so the kittens will be properly socialized. Many people want to get barn cat kittens, but they expect them to be friendly, not the hostile little monsters that you get when you leave barn kittens alone until their mama moves the litter to someplace you can find. But mostly mama cats come back to my door after an hour or two of freedom. So I’m pretty worried Consubstantial 1’s kittens may be orphans. These kittens are very young, but not too young to be started on solid food. And Char’s kittens are about 4 weeks and just started on solid food. Since Char can only feed 6 kittens at a time because she only had 6 nursing before, I’m feeding them in shifts. I put Connie 1’s kittens in the lower bin of the multi-level cat bed, and Char’s on the next level up. When Connie 1’s babies are done, Char’s babies get a turn. And I’m keeping solid food available at all times for Char’s babies and have let Connie 1’s babies sniff at it. I am hoping that I can manage to keep all 11 kittens going that way if the mama doesn’t come back. 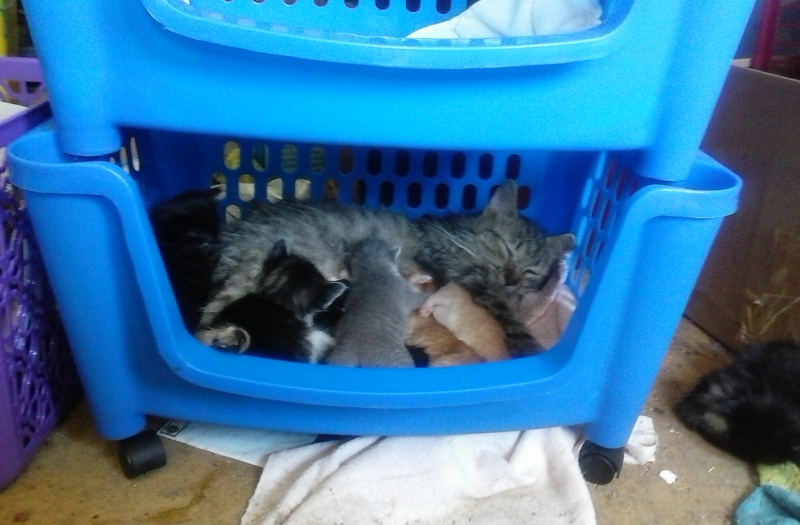 In other cat related news, escaped pregnant cat http://lexacain.blogspot.com/Consubstantial 2 has been recaptured, and this morning had 4 newborn kittens in her nest. I REALLY hope she will stop at 4. My barn cat Consubstantial 1 had kittens this year. When they were about 6 or 7 weeks old, she took them off somewhere and I couldn’t find them for a week or so. 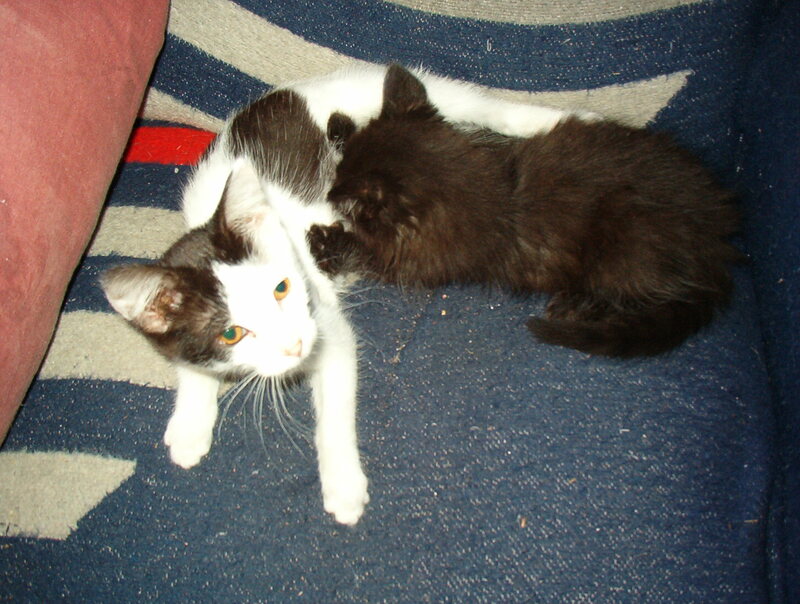 When she finally brought them back I took them into the house (and named them Scylla and Charybdis). They knew how to eat solid food— including mice their mama brought them— so I figured they’d be OK. But they missed nursing from mama and so started trying to nurse from their playmate, a slightly older female kitten named Umberto. They both really went at it. Umberto was puzzled. A couple times Scylla and Charybdis tried nursing from Umberto’s mom, Saipan— a cat who actually had a teat with milk in it— but they weren’t very interested. Maybe Saipan was low on milk since she wasn’t nursing Umberto much any more. So the kittens stuck with Umberto. They purr really loud when they are ‘nursing’. Scylla seems to be the ringleader of this nursing thing and really acts like she’s nursing, kneads with her front paws and everything. Charybdis is more of a follower. She nurses but keeps moving her nursing-spot around on Umberto’s belly and doesn’t persist as long as Scylla. I thought the two kittens were more than ready for weaning but they still seem to need to do it, even if they aren’t getting any milk. And Umberto doesn’t mind, she seems to interpret it as they are rubbing her belly for her and she likes it. But the last thing I need is more weird crazy cats— we’ve already got plenty.